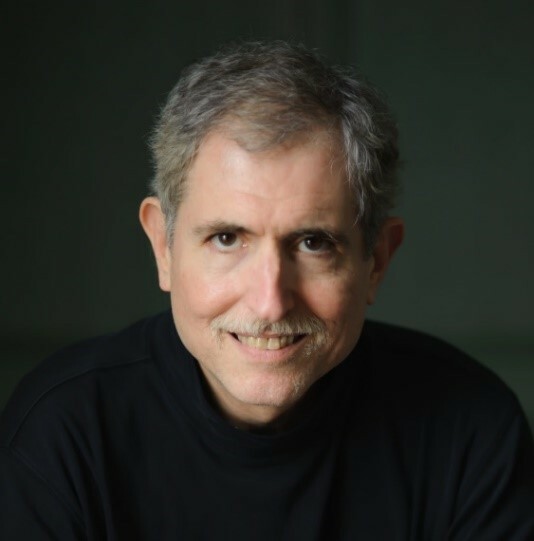 Author of “Advanced Apex Programming”, software developer, 3x Salesforce MVP and speaker. “Predicting the future is always tricky, increasingly so as the pace of technology change continues to grow. But here are my best guesses as to the year 2017 for Salesforce. 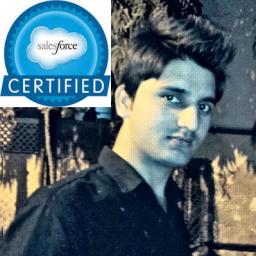 “Salesforce will continue to be a strong area for career opportunity. If the economy continues to grow, demand will continue to outstrip supply leading to greater opportunities and higher salaries. If the economy declines, the space will be more resistant to downturns than most, resulting in greater job security. “From a technical perspective, adoption of the Lightning Experience will move beyond new customers and early adopters and begin to see significantly greater adoption by existing customers, though I suspect mass adoption will still be 2018/2019. “Einstein will get more attention along with some early adoption, and Salesforce will continue to invest heavily in developer tooling and training. This won’t get as much “buzz” in the media as technologies like Einstein, but will have as great (or greater) an impact on Salesforce as a company and as an ecosystem. “I think we’re going to see major gains in what Salesforce can tell us about our data, including patterns to help close more deals and reminders to make sure to follow up with the right people at the right times. 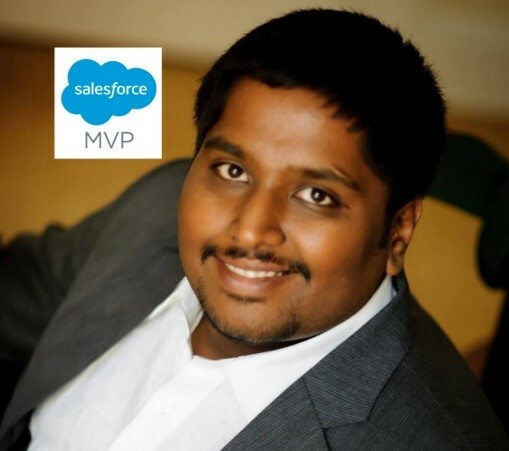 Vice President of Mobility & Technology Evangelism at Metacube, Salesforce MVP and speaker. 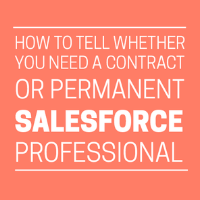 “I’ve followed Salesforce closely for nearly a decade. While the company continues to dominate the CRM space, Salesforce has also stepped out of its comfort zone in last few years. 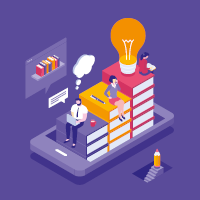 “For example, in year 2015, the company made a big bet on ‘Trailhead’, a self-learning toolkit for developers, administrators and business analysts. Last year, the company took the bold decision of announcing ‘Lightning’ framework and potentially redefining how Salesforce apps will be built in future. “This year, the company has made some big investments into machine learning and is making a huge play with ‘Einstein’, with artificial intelligence being embedded into all its products. I believe 2017 will be a defining moment as Einstein goes live — of course, it will be interesting to see the adoption rate, but so far all signs suggest that the future will be bright, the future will be intelligent. “Salesforce gave us a preview of what’s in store with Einstein at DF16. I’m looking forward to seeing more of AI in the coming few months and how the BeyondCore acquisition is going to pan out in terms of ‘smarter’ insights. “It’s also obvious by now that Lightning is here to stay. The deadline of February 2017 for all Appexchange apps to transition to Lightning is proof enough of that. So it looks like its high time leftover skeptics of Lightning changed over to the believers club. “What I’d also like to see in 2017 is improved Lightning support across the platform, making it easier to shift from Classic to LEX. “The Salesforce IoT and Amazon AWS marriage is something I’m really excited about, it’s going to open up new avenues in tracking customer activity. I would love to see more announcements in the IoT space too. “As always, I hope the platform continues to remain true to the core features and also for APEX to get some more much-needed love. 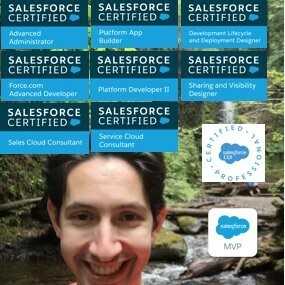 3x Salesforce Certified , Salesforce blogger and Salesforce Success Community Group Leader. 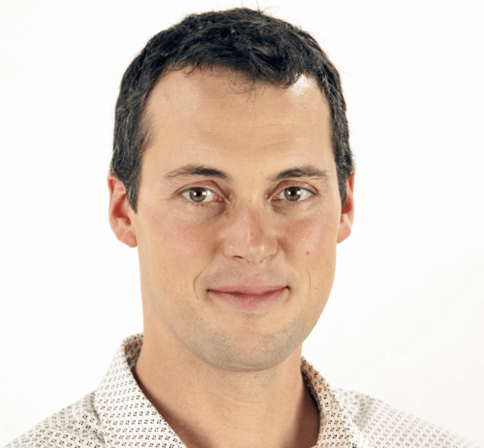 “I predict that Salesforce will introduce the concept of virtual reality. Think of the possibilities for Virtual Realities ads, the new platforms you can tap into to advertise for Marketing. “Chat, mobile, and AI will finally converge to form a killer app for mobile commerce. Chat facilities should be available in salesforce1 and Lightning experience. “Voice should be the next user interface for shopping. Consumers will increasingly use services like Amazon’s Alexa, Google Home and Allo, and Apple’s Siri not only to search for but ultimately to purchase the products and services that they love. “I can see Lightning Experience being enhanced. Operations need to be performed on multiple records, like Mass Update, Mass Delete, Multiple lead conversion, which are not available in Lightning. Lightning speed improvements will be seen. Innovation Management consultant specializing in helping businesses plan and execute Salesforce projects. “In 2016 we saw new Salesforce features in Salesforce Service Cloud, Lightning and Einstein. For many of us, the testing, improvement and deployment of Lightning alone has summed up much of the past year. “Here are 3 driving trends where I expect we will see rapid innovation and growth in the Salesforce community. “According to Merrill Lynch the artificial intelligence (AI) market is expected to exceed $153 billion dollars of growth by 2020. Based on modern innovation adoption theory we can expect to see approximately $25 billion dollars in 2017. “Looking to 2017, the improvements to Salesforce Service Cloud are perhaps the most significant of these releases to admins at SMEss. 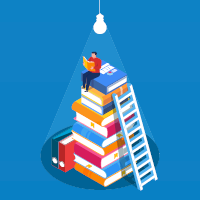 The new out-of-the-box capabilities such as map-based field agent management and case object support have escalated Service Cloud into the enterprise resource planning (ERP) leagues of Infor’s Syteline and ServiceMax. “The ability to better integrate customer support is enabling many industries to use what I call “the Dollar Shave Club strategy” to monetize a lifetime relationship with their customers…and the customers will continue to drive this trend. “If you work in the B2B world it is hard to miss the buzz around “FinTech” and blockchain. Wealth management, real estate and insurance firms are seeing the first glimpses of how tools like Conga Composer and Docusign can enable ‘smart contracts’. 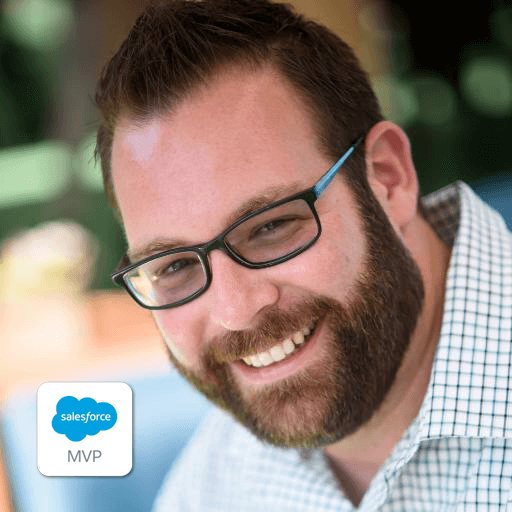 Salesforce MVP, 7x Certified, and Founder of blog Salesforce Ben. 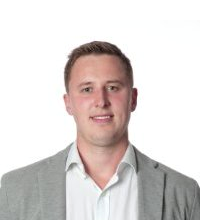 “In the next year, I think an increasing amount of existing Salesforce customers are going to be putting the system at the centre of their business. I’ve seen an increase in acceptance of customers not only starting to use the cloud platform, but are planning to migrate all departments onto it. I believe this is due to Salesforce making a real effort to ensure all of their cloud products are completely integrated and work seamlessly together. 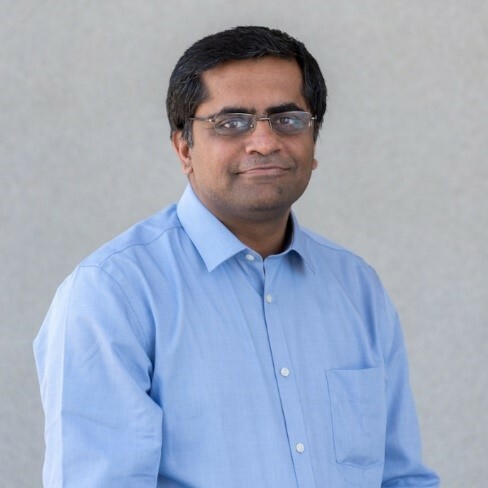 Salesforce MVP, 20x Salesforce Certifed, Bay Area Salesforce Developer User Group Organizer, and Lead Applications Engineer, Kenandy Inc.
“The benefits of Lightning are obvious, but customers have a lot of inertia to overcome to make the change. 2017 will be the tipping point from the Salesforce Classic to Lightning Experience. By the end of the year, more customers will be using Lightning than classic. This is due to a hard, multi-pronged push from Salesforce to incentivize switching. “App innovation partners, systems integrators, and Salesforce customers will build apps that are exponentially more exciting. Salesforce has acquired an impressive portfolio of companies recently, and is working to bring their capabilities to the Salesforce platform. Artificial Intelligence and analytics will become more native to the platform, and the pent-up demand for smarter apps will start to get satisfied. 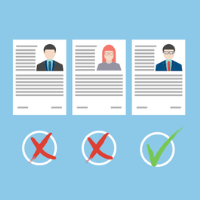 Any company will be able to build apps that previously only companies with top-tier talent could pull off. Think Netflix or Amazon capabilities for your local mom and pop shop. 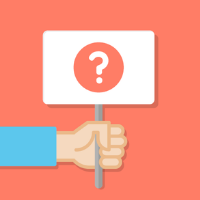 “Enterprise Resource Planning (ERP) software on Salesforce will become the norm. Kenandy has proven that companies of all sizes can run their entire operations on a Cloud ERP which installs natively on the Salesforce platform. In 2017 there will be a snowball effect as more customers migrate from their legacy ERP systems into Salesforce. Early adopters and ultimately the early majority will see the successes of the innovators group and follow suit once they see the real risk is in not migrating. “In 2017 Salesforce will enter the blockchain space in some way; perhaps through acquisition or partnership. Blockchain seems like an inevitable move for Salesforce. They are famous for being innovative, and they are software which records transactions between parties. The question is not whether they will, but rather when and how. We’d like to thank these notable members of the Ohana for their insightful Salesforce predictions for 2017. 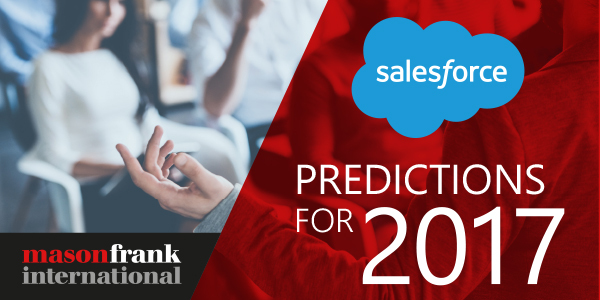 If you have any predictions of your own, please feel free to let us know in the comments below, and be sure to subscribe to the Mason Frank blog for more Salesforce news and insights.